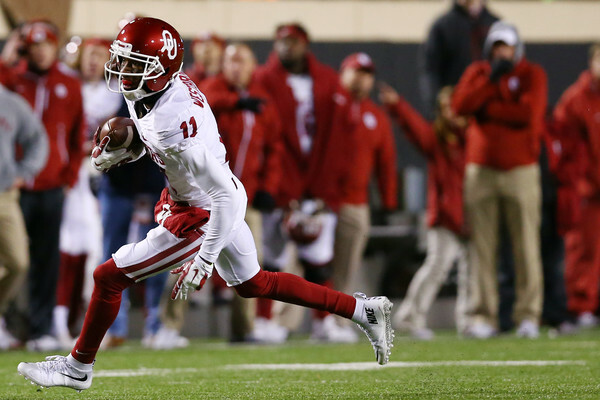 Already a semifinalist for the Biletnikoff and Maxwell Awards, Oklahoma wide receiver Dede Westbrook was named one of four finalists for the Paul Hornung Award on Thursday. The Hornung Award is given annually by the Louisville Sports Commission to the most versatile player in major college football. Westbrook, a senior from Cameron, Texas, who is having one of the best receiving seasons in Big 12 history, leads all Power Five players (and ranks second nationally) since Oct. 1 with his 207.7 all-purpose yards per game. On the season, Westbrook leads all Power Five players in receiving yards per contest (125.4), while ranking second in receiving touchdowns (14) and seventh in receptions per outing (6.8). He started returning punts Oct. 15 against Kansas State and began returning kickoffs Oct. 22 at Texas Tech. Westbrook is averaging 19.8 yards per punt return (registered a 71-yard return for a touchdown against Kansas) and 28.4 yards on his eight kickoff returns. Westbrook, who battled a hamstring injury during OU's first three games when he averaged 51.3 receiving yards per contest and did not score a touchdown, has exploded in seven games since. During that span, Westbrook has amassed 51 catches for 1,100 yards and 14 touchdowns. The 1,100 yards are the most ever by a Sooner in a seven-game stretch (next highest total is 985 by Ryan Broyles in 2011), as are the 14 receiving TDs. He needs one more receiving TD to tie the OU single-season record. Not only does Westbrook have the most receiving yards in the country since Oct. 1, no player is within 185 yards of him. His 14 receiving scores have come, in order, from 67, 40, 71, 42, 47, 26, 8, 88, 49, 23, 41, 65, 29 and 40 yards, for an average of 45.4 yards. The 14 TD catches over the last seven games are more than 44 teams (21 Power Five squads) have on the season. Only 10 teams have more receptions of at least 60 yards this year than Westbrook's four. Westbrook has already doubled the Oklahoma single-season record for touchdowns from scrimmage (rushing or receiving) of at least 40 yards. The former record of five was set by Tommy McDonald in 1956 and matched by Marcus Dupree in 1982. Westbrook has 10 touchdowns from scrimmage of 40-plus yards this year. Only two FBS players have more receiving TDs this season than Westbrook's 14 in the last seven games, and only eight FBS players have more receiving yards on the year than Westbrook has in the past seven outings. Westbrook has more receiving yards this season (1,254) than Army, Kent State, Navy, New Mexico and Tulane each do. In Big 12 play, Westbrook ranks first in the conference in receptions (7.3 per game), receiving yards (157.1 per game), points (13.1 per game) and all-purpose yards (207.7 per game). His 157.1 receiving yards per Big 12 game are 53 more than the next closest player (Oklahoma State's James Washington; 104.7). The 16-person Paul Hornung Award National Selection Committee chose the finalists, with fans generating the 17th vote online. The 2016 Paul Hornung Award winner will be chosen from among the finalists and announced Wednesday, Dec. 7. Hornung was a Heisman Trophy-winning quarterback at Notre Dame in 1956 and the NFL's Most Valuable Player with the Green Bay Packers whose versatility earned him enshrinement in both the College and Pro Football Halls of Fame. At Notre Dame, Hornung played every position in the offensive backfield, handled punting and placekicking duties, returned kickoffs and started at safety on defense. He set an NFL single-season scoring record for the champion Green Bay Packers in 1961 that stood for 46 years. Fan voting for the winner opened today here and will count as the 17th vote. Fans can vote once every 24 hours for their favorite among the four finalists.